Sorry for not posting for so long but there was an exam week and studying took up all of my time for about two weeks and the week before that I was in vacation in Paris so I was visiting a bunch of places and studying so I didn’t blog. All of sudden a heavy silence covered the room. Why was he in this room? Casper stepped in front of his brother trying to hide him. Hans was shaking like a leaf in the wind. “How can we help you , sir ?” intervened Alexey. For a moment Cas felt like he was falling into the darkest abyss. But than Alexey threw himself in front of Cas, puts his strong arms around his shoulders and push him right in front of the first mate. Then there was a powerful force to give him back his strength . Chin up, straight shoulders, Cas saluted proudly: “At your service, sir”. I would reccomend this series for ages 11 (if you fairly advanced and can deal with some death and sad parts) to age 16, it would still be fun then but maybe a little cheesy or just too kiddy in general. The Underland chronicles is a 5-book series and each book can range from 300-350 pages. Probably the first thing that caught you eye is the name of the author in the picture above, and yes, this series is by Suzanne Collins, the author of The Hunger Games. I read this series twice completely through. The first time was when I was almost ten and the second when I was eleven (yes, I know I’m a hypocrite, but Probably with all the books on my list I’ve read it at a younger age then I recommend them for so stop complaining😤). Gregor, the main character, is living a normal life with his single mom (his dad dissapeared one day never to be found) and little sister when he find a huge whole in the laundry room at the bottom of the apartment building he lives in. Gregor’s little sister boots, falls in the hole and Gregor follows. They come out in an underground world where rodents and insects are as big if not bigger than normal people. They also find humans by being brought to their city Regalia by riding on the backs of two cockroaches. In Regalia Gregor meats Luxa, the future queen and her cousin Howard. When Gregor arrives he realises that this city is not modern and does not have technology or gunpowder. Gregor is welcomed warmly and he realizes that there is a prophecy about two overlanders (Someone who lives in the normal world) that will travel with eight underlanders to save a captured overlander. Gregor is discovered to be the “warrior” that the prophecy speaks of (Boots is the other overlander). Gregor has to, unwillingingly, make the journey with Luxa, Henry, some cockroaches, bats, spiders and ripred the rat. During the whole series Regalia is at war with the rat kingdom (ripred is a traiter to his kind so he’s good). Throughout the series Gregor keeps helping Regalia with problems (not allways for selfless reasons as he once had a plaugue that would kill him if he didn’t find the cure in the underands). He gets very attached to the city and gets a crush on Luxa and it’s hard for him to go back to his mother eventually. Well, as you probably already guessed because of the author, the writing was GREAT. the storyline made sense and everything was clear. There weren’t any cheesy parts. The plot of every book in the series was great and I got hooked immediately (that’s why read the series twice). There were great and interesting moral conflicts. There weren’t only happy parts but also sad parts and death/betrayal. 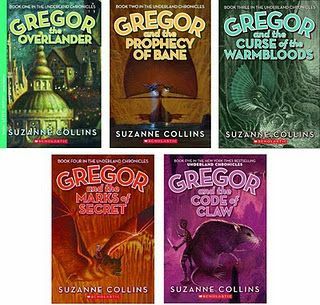 Everything that happened in the series had a reason and made sense so when Gregor kept staying in the Underlands after every book instead of going home there were either good moral reasons or other good reason (like having a plague that can only be cured in the Underlands). All in all this was an amazing series and I give it a 9.5. This list is going to go in order from the youngest age I would recommend these books for to the oldest. I read rangers apprentice when I was nine, I read a lot for kids my age so I was very advanced, (I was and still am also very humble😉) then reread it like one and a half years later. 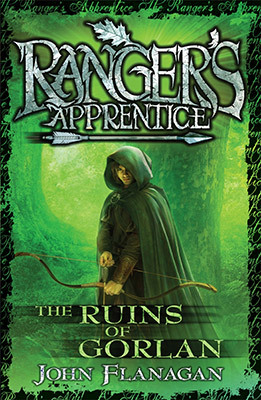 Rangers Apprentice is a thirteen-book series, each book containing approximately 250-350 pages. I loved all thirteen books both times. It’s hard to give a short summary of a 13-book series but I’ll try: Rangers Apprentice plays out in the middle-ages–as in theres no guns but swords and kings–but it’s still a fantasy world and nothing in it has any historical relevance. It starts off with a teenager (14 I think) whose name is Will. Will’s father died in battle just after Will was born and Will’s mother got sick soon after her husbands death. Will was left on the doorstep of the baron of Redmont (the castle he lived in). Will was cared for in a group with four other orphans. When it was time for everybody in the city to chose a job to train for the orphans all knew what they would pick. All of the other orphans were accepted except for Will who wanted to go to the warrior school. When Will was turned down though, a man came out of the crowd and chose Will to be his apprentice. This man was part of the Ranger Corps, an elite force of spies and problem solvers. Will was trained under his master Halt and learned archery like no-one out of the ranger corps could and was also trained in sneaking and camouflaging. Throughout the series new problems come up in the kingdom of Araluen and Will is sent out to fix many of them with his master Halt. I won’t explain the plot of every book in the series but suffice it to say that every problem was completely unique and original so it wasn’t like every book a new bad guy comes and leads an army to take over the world. Alexey was strongly built and he towered above Cas. Now that they were off the deck though Cas had to talk to Hans. “Hans, what the hell were you thinking! how did you even get on the boat?” Hans didn’t seem so cheerful anymore. “I just wanted to be part of everything,” he said. Then added more softly “And I wanted to be with you”. “That’s all good and well Hans but what about mother! She’ll be worried sick if she knows you’ve gone with me. and you know you have to be eighteen!” “It’s ok,” Hans said in a confident voice Cas knew was fake, “I’ll be very useful and I won’t be a burden. I’ll stay out of sight and I’ll even do all your chores in your room just as long as you guys don’t tell the captain.” The sailors nodded reluctantly in agreement but Cas wasn’t done with him. “What did you tell mother when you ran off like that?” “I just told that I was gonna go play with some friends” Hans replied. Cas sighed. Then the first mate walked in. My grandmother and I are doing a kind of game where she writes a paragraph (or more) of a story we´re developing and then I continue on what she wrote and then it’s her turn again and then me etc. 1598 in the port of Rotterdam. Five sailing boats were getting ready to start a journey which was going to change the face of the world. Casper was one of the sailors. He was excited. His patience was running out. “Cas, (his friends call him that) hey, Cas, the boat is ready “. And, oh, how ready he was! He turned, took a last look from the shore and, yes, “Liefde” was ready. He held his mother tight not wanting to see the tears in her eyes. Hiding his emotions he ran to join the brave men of the “Liefde” crew. It was going to be a very long journey. Only the ones with passion, courage and love for adventure were going to survive. The sails are high up and the five monumental boats, the best in the world, started moving slowly, very slowly. Soon the port of Rotterdam was going to be a memory. Though Casper was bored and impatient while he was waiting, now he couldn’t have been more excited. It was finally happening! He tried not to think of his mother whilst the port was fading out of his eyesight. The ship was huge! It was the biggest he had ever been on and it was at least 100 meters along its length. And there were 3 other floors under the main deck! The ship was also beautifully built. The sides were painted in lines of black and red and he hadn’t expected to be in a room with only 14 other sailors. The deck was also very clean but he didn’t expect that to last very long without any disobedient sailers. “Hey Casp!” yelled one of the crew. his name was Hans, he was Casper’s younger brother. Hans was standing near the bow of the ship and he was waving excitedly. I have recently watched a few videos on youtube of the daily show with Trevor Noah. On this channel there is a subsection that’s called: Jordan Klepper fingers the pulse. In these videos Jordan Klepper, a journalist, interviews Trump supporters mostly but also democrats. In one of these videos he interviews Trump supporters at a rally to ask them about what they think of his “locker room talk”. Some answers were very surprising. Two men said that they thought that it was completely moral to “grab her by the p****” and many others Jordan interviewed agreed with that statement. When Jordan asked them to elaborate most of the men actually implied they’d done it themselves once or twice. When Jordan interviewed the women at the Trump rally many of them said that it was just how boys talked and that all men talked like that. A funny part in this video was when Jordan left a young man completely flustered after using a very simple counterpoint to his argument. The young man was saying that that was just how men talked but when Jordan asked him if he talked to his father or his friends that way and if his friends talked to him that way and even if he ever heard anyone talk that way and the answer was no to every one of those questions. The most surprising response though, was a man who said he had proof that what Trump did was moral. He said he asked all the women at the rally and that have of them “wouldn’t mind” being grabbed by the p**** if it was Trump. In a different video Jordan asked Trump supporters what it would take for them not to vote for him and the most common answer was “nothing”. Apparently if he did stab someone on 54th street most people would still vote for him. I guess he’s just so good for The US that we need him no matter what. *sigh*. this is the full story of the eye of the sphinx and in case you haven’t been following the segments you can just read this in one post. It was just a normal day in Omdurman. The streets were filled with traders, shopkeepers, apprentices, shoppers and mainly, beggars. This last category is what Ali’s family was. His grandmother is much too old to work. His sister Chione is only eight years old so she is too young to work. Both Ali’s parents died before he was born for unknown reasons, unknown by Ali at least. To pay for food, Ali’s grandmother and Chione beg throughout the day. So that leaves Ali. He is 14 and old enough to work but nobody will take him as an apprentice. This is because many people think he is cursed because of what happened to his parents. That leaves only one other job: Stealing. Sometimes Ali got caught and sometimes he didn’t. Sometimes he came home beaten up and with no money and sometimes he came home with enough for a good meal for everybody. Ali was a very minor thief because most rich people had too many guards to steal from. His life has always been the same: Wake up, buy breakfast for everyone (if he had enough pearls), start his thieving, come home, have dinner (if he had enough pearls), and then go to bed. One day he was coming home from his “job” and he passed by his sister’s usual begging spot, but she wasn’t there. He saw his grandmother on the ground. There was no heartbeat. There wasn’t a mark on her so he had no idea what had happened. It could have been natural causes, considering her age. Suddenly, he heard screaming and shouting from an alleyway and he started running towards it. “Chione, Chione!” Ali shouted. But a man was blocking the alleyway. Behind the huge man, he could see shady men taking his sister forwards. “Chione, I’m coming!” With the thieving skills and nimbleness of a fourteen-year-old Ali sprinted forwards and ducked under the huge man’s arm. He ran to catch up with the mysterious men, but they were well trained and it was hard to keep up. He still kept running and running but he was losing them and he was getting tired. Suddenly, he was pulled into an alleyway by a strange man. In all his rage and panic, Ali was a bit delusional. “GET OFF ME YOU MONGREL, THEY HAVE MY SISTER AND I WAS ABOUT TO CATCH THEmmm…..” He trailed off as he realized he had been hit on the head with a club. “I’m sorry,” the strange man said, “…but it is better this way”. Then everything went black. Ali eventually convinced Mura to start teaching Ali basic fighting, endurance, and the weaknesses of this cult and what they do. Most people call this cult “The Arcanum Umbra”. It has around 700 members and their home base is in Kemet, but people only know that the entrance to it is somewhere in a sphinx, but no-one knows exactly where. They’re known to kidnap people with unusual ancestry, but nobody knows why. “Faster! Harder! Better!” Mura was not a very forgiving teacher. Over time while Ali was training with Mura he got to know a bit of Mura’s past. The reason that he knew so much about The Arcanum Umbra was because he also had a family member kidnapped and taken away. It was his mother and when she was taken he was only 10 years old; just old enough to know his mother well and love her a lot but just young enough to make the loss that much more devastating. He has tried but has never found his mother in all his years searching. She would have, of course, passed away by now. Mura has held a grudge against The Arcanum Umbra all his life because of this incident. That is why he was so willing to help any other who had gone through the same thing as him. He has helped other people before Ali and when he deemed them ready and they set off he has never seen them again. All this made Mura hard and he was determined not to fail again. “I won’t, I’m ready to save my sister,” said Ali confidently. “Yes Yes, now tell me what it is!” shouted Ali. “It will be dangerous,” Mura warned. “Where is this base then?” Ali asked, sounding determined. The next day, Ali set out in town to find out where Opus was. He was looking for especially shady streets where some bad people might be hanging out. Of course, he knew exactly where to look because of the people he used to know and work with. He found a middle-aged man who looked like he may have some knowledge about gangs and cults. “Well that depends on what kind of questions, boy.” said the man. “Just someone who has some business to take care of,” Will said a bit suspiciously. “I’ve heard… rumours” The other man said. Suddenly the man pulled a knife out of his pocket and swung at Ali. Ali jumped out of the way just in time and he also drew his dagger. “We don’t have to do it this way,” Ali said, but the man wasn’t listening. He tried to swing at Ali again but Ali parried and that made the knife fall out of the man’s hand. Ali went up to him and put his dagger to the man’s throat and he surrendered. After some interrogating and maybe just a few threats Ali found out that this person works for Opus. A while later Ali finally got him to reveal the location of Opus. It was close to dark when Ali got to Opus’ hideout. There were 15 guards patrolling the area, but Ali was very good with stealth, so it wasn’t a great challenge to sneak around them and get to the back entrance (every criminal hideout has to have a back door). There were also two guards at this door. He was trained to use slingshots so he slung a rock at one guard while he dashed forward and knocked the other out with the flat of his dagger blade so they both wouldn’t make any sound. He grabbed a key off one of the guard’s belts and used it to unlock the door. He went inside and found himself in a gigantic hall. In the middle of it was a single child surrounded by more guards. They saw him and Ali grabbed his sword and started fighting. He had already dealt with eight of the ten guards when the child started crying. He looked about seven years old. Quickly, Ali dashed up to the kid and scooped him up. “Just hang on tight and I’ll get you out of here” He ran out of the back door again, but the guards didn’t follow. Presumably, they were frightened because of what Ali had done to the rest of the guards. Ali ran a different way then he came in because he wanted to throw off the guards that were guarding the main entrance. He came out onto the street and kept running. When it seemed like the guards would never catch up Ali set the child down. “Do you know where your mom is?” “I-I-I think it’s just a few blocks down.” Suddenly, Mura appeared on the corner. “I see you’ve done your job well. Take the child home then meet me back at the house. Ali had a good night’s sleep and the next day he set off to Kemet with all the supplies he needed. The journey was about a week long of heavy walking but there was no unusual trouble on the way. When he finally got to Kemet he was extremely excited to see his sister again. He asked a lot of townspeople where he should go to find the sphinx and they were more than willing to tell him because they all hated The Arcanum Umbra. He went to the Sphinx and there he saw nothing that was out of the ordinary, but when he put his ear to the stone he thought he could hear faint screaming. He looked at the whole sphinx but couldn’t find anything that resembled an entrance. When he looked at the Sphinx again he thought that there might be a hidden panel somewhere in the stone. He couldn’t find anything. Then he realized that if he were in the Arcanum Umbra he would put the entrance in the hardest part of the Sphinx to get to the head. Ali climbed up to it and pressed one eye. Nothing happened. Then he pressed the other eye and it opened up. He had finally found the entrance. Ali surveyed the inside of the Sphinx and it was huge. There were hundreds of cult members and it seemed to him that it would be a lot easier to rescue his sister using stealth. There were a bunch of children in the middle of the sphinx and guards all around them. He descended a staircase and hid behind a pile of bricks. He looked beside him and realized he was standing very close to a cult member. He had a plan. Ali smacked the guard on the side of his head with the flat of his blade and the guard became unconscious. Ali stole his clothes and went forward to the children. “Hey what are you doing here?” a cult member asked. On the journey home, Ali and Chione had more than enough time to talk about what had happened to them in the past two years. Because Chione was not trained on endurance it took a few days longer to walk back to Nubland than it did for Ali to get to Kemet. Ali decided to introduce Chione to Mura. When they got back to Nubland, Ali told her the bad news about their grandmother but it turned out that she already knew what happened because she was there. Ali took Chione to Mura’s house and they knocked on his door. “Who’s there?” Mura said. “It’s me, Ali, and I have someone I would like you to meet.” The door opened and Mura stepped out. “Pleasure to meet you, Mura, I’ve heard a lot about you,” Chione said. They shook hands And Mura led them inside his house. He gave them food and something to drink. “Well, sometimes it is a bit lonely in here and I could use some help shutting down The Arcanum Umbra,” Mura said softly. “Are you saying we could live with you?” Chione asked. “Ummm… I guess so,” Mura mumbled. They helped people who had family members who were taken by The Arcanum Umbra. Slowly they figured out what The Arcanum Umbra were doing and why they were doing it. Slowly they were shutting it down and at the end of this, they were planning on completely destroying The Arcanum Umbra.